Protecting you and your valuables from the elements while boosting the beauty of your home’s exterior, your roof is one of the most important structures of your home. When you need a roofer in Hamilton and surrounding areas, contact the professionals at Main Street Roofing. Our valued clients enjoy the personalized customer service they deserve along with the top-quality workmanship of experienced roofers. 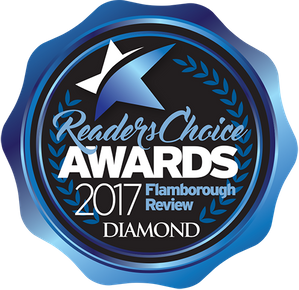 Winner of the 2016 Readers Choice award from Flamborough Review, you can feel confident that your end result will exceed your expectations. For a free estimate on roofing services, call us today. We have established a stellar reputation for the care and craftsmanship we provide on every roofing job. We take special care with your home and property to ensure worry-free roof repair and installation. We have proudly served Hamilton-area customers since 1991. Over 30% of our business comes from customers who have recommended our top-quality workmanship and friendly customer service to their friends and families. We'll guide you towards choosing the perfect roof that will beautify your home or business and give you peace of mind. A roof doesn't just keep you warm and dry, it can represent up to 40% or more of your home's "curb appeal". Knowledgeable custom home buyers and builders choose us because of our skill and experience in installing slate or cedar shingle and shake roofs, custom-crafted copper roof accents and metal flashing.